When Heather Janke hears that her oldest and most faithful customer, Eva Schneider, has been bonked on the head and is in hospital, she’s shocked to the core. Especially when she discovers one of the main suspects is her newest assistant, Ken. With nothing but her eccentric puppy dog, Dave, and her burning desire to help put Eva’s attacker behind bars, she sets out on another sleuthing endeavor, determined to find the truth. 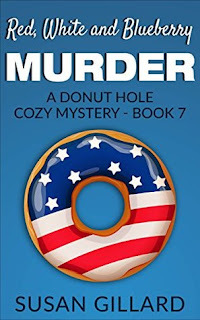 But Heather has more to deal with than just the case: she has to balance a busy Donut Delights with the busy season in full swing, as well as the plans for her impending nuptials to her handsome detective fiancé, who is less than impressed with her extracurricular activities. Heather must get to the center of the mystery, but this one might turn out to be deeper than a donut hole. Who would have thought being an owner of a donut shop would put someone right in the middle of a number of murders? That’s exactly what seems to continue happening to Heather Janke, the owner of Donut Delights. She is so relentless when it comes to investigating murder mysteries. She not only risks her life with her investigations, but she risks her relationship with her fiancé, Ryan. It’s more than a conflict of interest since he’s the lead detective on each case. This time one of Heather’s oldest customers is left unconscious with no substantial clues as to who would have done such a thing to this sweet old lady. Heather is determined to find the culprit and bring him or her to justice. Can she learn the truth and keep her relationship with Ryan intact? I love these quick cozy mystery reads. It’s amazing how the author can combine mystery and romance in one short book. It is just the right amount of each, with the mystery being main focus. That’s just the way I like my cozy mysteries. Although there is no murder in this particular book, it doesn't matter. The intrigue of the quest to find out who did this is fun to follow. Disclosure: I borrowed this book through Kindle Unlimited. I was not required to write a positive review. All opinions expressed are my own. Love the cover, name, and synopsis of this book.